A game, its settings, challenges, is communicated by several forms of language. In nature, the game of survival in the forest or the game of mating has a precise setting, in a digital realm created by programmers the game environment must be defined and presented to the players. Language is involved in both cases. How the forest communicate a message to the player ? how competition for mating communicates a message to the player? How a video game communicates a message to the player ? How primordial symbolic language work ? Decision making is, for humans, not always a logical process, and not always based on any form of strategic thinking. It is my experience that strategic thinking must be trained. It is not a natural advanced skill, besides the application of those algorithms learned for survival purposes like how to reach food, water, sleep, shelter and safety; or those more complex associated to reproduction and social interaction, mating and clan/care. I think language in those terms is essential, but symbolic language and in particular primordial symbolic language creates field for communication that holds a matrix type of meanings or cyphers with matrix dimensions of meanings. A cypher makes it possible for a message to be encoded by application of certain rules. For primordial symbolic language, perception, background knowledge are essential for the purpose of identifying the meaning, message communicated. In that sense, the parties that would take roles along the communication process may, along their exchange, recognize each other “level” or capacity of perception and background knowledge. If they are successful in this process, they may also agree on message, its function and its meaning. It is a common experience when utilizing primordial symbolic language that one user may perceive only 3 dimensions of the message and another one 7 dimensions, for example. Strategic thinking based on these conditions will vary from user to user, there for as well the outcome. Strategic thinking is limited by perception. Primordial symbolic language do utilize nature principles, laws, rhythms, cycles and human potential stages of development as metaphors and references, yet the message is cyphered. This fact makes the play of the game (game theory) by each user, the strategies applied, extremely interesting. For example why an user with only 2D perception may win a game against another user with 8D perception capacity ? Here the counter question: what does mean winning the game for the user with 2D perception and for the user with 8D perception ability ? When the strength becomes weakness and the threat opportunity ? Which are the goals of the users ? What does it mean to win ? I have experienced that for players with higher Matrix-Q, win and lose may vary in meaning and for example to win may not be always the main aim of playing. In our example, both users may have won, but only one of those agree on that idea. The other one believe is himself alone the winner. Here my question: how to know what is not known ? when knowledge and lack of knowledge becomes the same field of knowledge ? when the edge becomes a gate, a door and not a limit ? How to think any thing for which we do not have any background knowledge or previous perception ? Can we perceive something we have not perceived before ? Questions for game theory… if nature laws, principles, rhythms, cycles are part of the game, which is the game being communicated to each player? here is when primordial symbolic language creates the game for each player, because each player perception and knowledge. Along my research and process of development of PSPL based on PSL (Primordial Symbolic programming language, primordial symbolic language), i have arrived to the conclusion that syndication is necessary. For example from the field of perception and background knowledge of an user with 2D perception ability to that other field of an user with 8D perception ability. In game theory we assume both players have the same ability to understand the language of the game, but one or the other one may have more skills or ability to play the game and win the game. When we add language to game theory, perception, then we individualize the description of behavior of the players. It can not be generalized any more. Even two or more players may engage in the same strategy, they may be doing something different. The outcomes may be different or the same. But both did something different. For the assessment of game results and points, the winner is the winner, the others are not the winner. But from the point of view of PSL, may be more winners than those visible by the 1D player. Consider 1D game the most simple obvious mechanical interpretation of the language utilized to create the message of the game. 9D would be a cyphered matrix of several possible meanings, there for games, within the game. 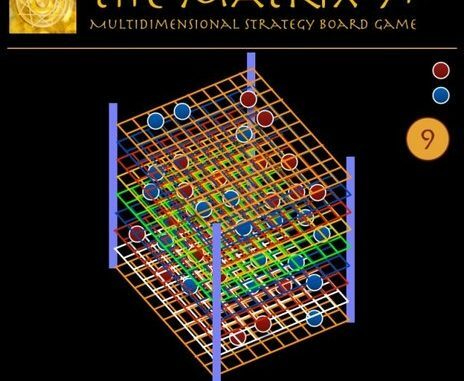 In the matrix 9+ strategic board game, there are several games than can be played by the players while playing the game level zero. It means the same game suggests several possible games to be played simultaneously. DOI: 10.13140/RG.2.2.20993.86883 When a player plays this game which game(s) is he/she/it playing ? is the counter part aware of them ? On the contrary, in the 9 Tribes game, http://matrix-9.luisdanielmaldonadofonken.info/the-9-tribes/ every one will win, the question is not about winning but about the process cocreated for achieving the aim of the tribe(s), the challenge given by the game and the gods. As each tribe has unique perception qualities (limitations) the game proceed accordingly, random moves defined by the play of stones (similar to runes) will define the path of the game process, and suggest to the players opportunities for decision making and implementation of strategy. After each player plays, each tribe will perceive the move from a unique point of view. Yet, here is the challenge, if a player with 1D perception ability plays the tribe of earth, and a player with 5D perception ability plays the tribe of wind. How each of them will understand the meaning and strategy of each other play ? How collaboration can take place in this case ? The prime pax game, in that sense is alot more simple: http://matrix-9.luisdanielmaldonadofonken.info/prime-pax/ the game have been set, it is reachable in the tangible reality, but without information it can not be played properly, It is necessary players earn the ability to play by first gathering the necessary information. Without background knowledge perception, understanding, is limited. In all cases listed above, PSL has been utilized. Game theory can not focus only in the art of winning. Master Sun Zu, described in the book of war the necessary conditions for winning. Master Sun Zu utilized nature, raw survival principles, studied and solved, for the art of war. The art of war book is nothing else than application of nature laws, principles, rhythms, cycles and human stages of development, for war winning. In my book the “art of war, peace and life”, the game is not any more about creating war as a mean of ensuring national and cultural survival, defense or expansion; but focus on creating and protecting the necessary conditions for life, sustainable living. If game theory would focus only on competition then war games would be the only type of games humans could develop skills with. Gladly game theory is not about winning, but about playing. Along the cold war the game was so good played that nobody won. For example. If the board of GO game would change every 9 moves, and expand or reduces, the players would have to face a completely other game. https://en.wikipedia.org/wiki/Go_(game) but as the settings of the board game have been defined. Which is the game players would, despite the level of perception and background knowledge capacity they have, play for ever, an endless game ?. If the play, moves, decisions of the players would vary according to the players evolution, and if for each new evolutionary stage the game would change, by assuming that players will always evolve, there is a chance the play will never end, or end very quick. PSL applied to strategic thinking and game theory may create more challenges, make math of game theory un-useful or fully purposeful, may take the fun of playing away, or create an endless game, for those play-addicted. If PSL is applied to leadership, social strategic management or economy, if we consider the three of them as games, the players that challenge each other (leaders, parties, institutions and policy that define the current economy model and its alternatives) will need to face the fact that the mass that play along (the ones lead, the government and the citizens, the stake holders of economy, the household holders) may not agree on the game being played. For example: if an underground organization utilize the laws, and government structures, to profit from ignorance of people or fear, and make profits increasing its ability to play the game of economy and leadership. Or for example if a country that invest in defense, after reaching the wished milestone, decides to conquer neighbor territories through war, which as result boosts is national economy, make use of natural leadership talents in its community and creates the settings for a total reformulation of strategic social management, governance, adjusted to the war challenges but as well to the needs or wishes of a future after war, peace!. Or for example, a movement of artists that intent to induce cultural change through arts creation, but by lacking financial resources for their artistic revolution, engage into painting on public structures and flash mob at public private places. Civil disobedience is another way to play that another game within the game. All depends on what has been understood, perceived in the message and in the game. For example by each political party. Then the natural question follows, which will be the player strategy, choices. But we seldom ask: what would mean for the player to win ?